AMD or polluted mine water, plagues mining operations the world over. It is considered by many to be one of the greatest environmental threats in South Africa today, occurring at a time when a looming water crisis already poses a threat to clean, accessible water for the country’s population. Inherent within the process of disturbing the earth’s crust and digging ever-deeper for precious metals is the inevitable after-effect of debris making their way back into the environment through the air and water. AMD occurs through natural run-off after rains flush through a mine dump; from mine companies disposing of the water used in their operations; or from old, disused mine shafts filling up with water, eventually decanting above ground. It high in sulfates (salts) and heavy metals (such as uranium and other toxic and carcinogenic heavy metals), and bears a low pH, the marker of acidity. South Africa is the heart of Africa’s gold mining operation. Communities across the country are threatened with AMD as old, disused mine shafts fill up with water, current operations leak their refuse, and tailings stemming from mine dumps, scattered across the country, blow into the air, finally making their way into rivers, streams, and South Africans lungs. While the problem isn’t unique to South Africa, the country’s long history of mining, matched with a poorly enforced regulations and a virgin environmental movement, means that mine waste is left largely unaddressed. Many of the major mining houses have pocketed profits and packed up, leaving a slow-acting government to clean up their mess. As a result, the country is facing a crisis of phenomenal proportions. On windy days patches of Soweto are covered in white and yellow mine dust from dumps surrounding the township. 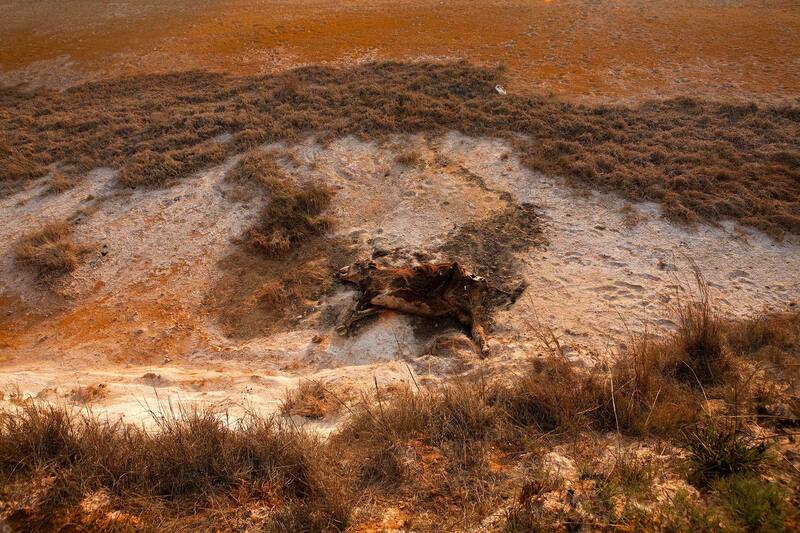 Both the Cradle of Humankind, a UNESCO World Heritage site, and the city of Johannesburg are threatened with rising acid mine water, which could eat through the historic caves and central buildings. Some of the country’s largest and most important waterways, such as the Vaal Dam, are already feeling the impacts of unmitigated and uncontrolled mine waste. This essay takes a closer look at the complicated issue of acid mine drainage (AMD) in South Africa by focusing on communities most affected by it. It attempts to look beyond the heated rhetoric and political and legal machinations and into the widespread nature of the physical problem and into the lives of those living with and fighting against a degrading South Africa.